And this writer’s brain just . . . Doesn’t. . . Turn. . . Off. It’s like a hound dog searching for story. Which is precisely what happened when I came across Mr. X (obviously not his real name) recently. 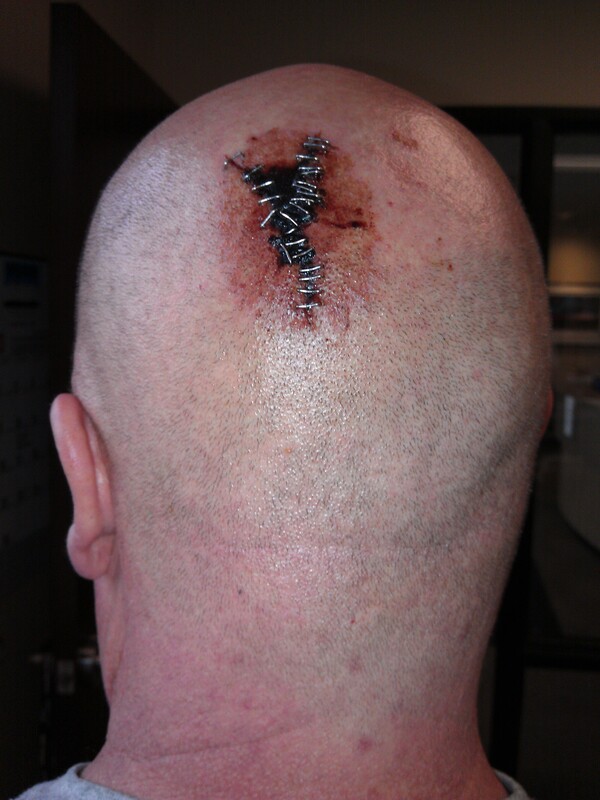 Now, guys being who they are, he refused to tell me how the twenty-seven staples appeared on his head. He even demanded his work buddies not say a word. *Insert pout* Of course, he had no idea he was talking to a writer. We are a special breed. We spin stories out of any stroke of inspiration. 1. Mild-mannered construction-type dude by day, Mr. X is really a secret agent running covert ops in our part of the Pacific Northwest. His latest assignment: pose as a drag queen in order to infiltrate a smuggling ring of car thieves. Unfortunately, he had yet to master the “art of the walk” in his four-inch stilettos and in a thigh-high-slit maxi skirt, let alone the running part. So while he chased after the bad guys, trying to stay on their trail, he stepped into a deep sidewalk crack and fell backwards. And that’s when his head struck the bumper of his secret agent car, which automatically dialed his status to headquarters. When back-up arrived, he was out cold, and the thugs made off with his new Manolo Blahniks. . .. the swines! 2. Even though he’s a no-nonsense construction-type dude, Mr. X has a soft spot – for kittens. (Awww!) When he woke up one morning, he heard the frightened mewl of the newest addition to his menagerie of twenty-three cats. Poor thing was stuck up a tree in his front yard. Rather than take the time to call the fire department for help (because, hey, he’s a dude), he shimmied up sixteen feet until he reached the scrawny, wide-eyed, fluffy white kitten he’d named Pumpkin Pie (PP). She was perched at the end of a limb, with her gaze trailed downward. Her painful mewl tore at this heart. He had to save her! But as he reached for her, PP leapt. While she safely landed feet first on the ground, Mr. X did not. 3. Like any hot-blooded American male, Mr. X loves his woman. And he’d do anything to defend her. At a recent visit to their favorite watering hole, some other dude commented on Mr. X’s woman’s lack of grace at the pool table. Mr. X let that one slide. After all, his love for her doesn’t depend on her ability to win a few bucks at pool. But when Other Dude insulted the size of her well-endowed chest, well. . . that one was a little hard for Mr. X to let pass. After all, he’d paid for those! So he insulted Other Dude’s woman with a comment about her mustache. Trading insults soon devolved into a screaming match. And the screaming match further devolved into a fight. Involving fists. And chairs. And a trip to Emergency Department. . ..
4. Mr. X has a secret. One that even his closest friends don’t know. Like me, Mr. X is a romance writer. (Although, he’s famously known as erotica author Candi Lishious with over a million books sold. Go, Candi!) Mr. X, aka Candi, likes to work through scenes in his/her novel to make sure they’re doable. (Don’t judge. We all have a process!) One particularly tough scene involved a stepladder and a chandelier, and Mr. X/Candi wasn’t sure it was physically possible, so of course, he/she had to try it. Unfortunately, the ladder had a busted rung. Mr. X/Candi swung his left leg out, and the rung snapped. (You should’ve listened to your company’s safety person – just sayin’!) The stepladder toppled, and Mr. X/Candi hit the edge of the kitchen counter on the way down. So, yeah, that scene didn’t work out too well. . ..
5. Mr. X, mild construction-type dude by day, is also lead guitarist for a local rock band, The Swing and Sting. He loves the wild nights of rock and roll, and the groupies that hang around afterwards. Being single has its perks! One night, he snuck into the alleyway that separated the club from the Church of Immediate Redemption, for a quick smoke. And that’s when he heard it. Felt it. That creepy weird feeling that trailed down his spine whenever SHE got close. He reached for something, anything to use as a weapon against HER, while at the same time he searched for the door handle behind him. And from the shadows emerged a figure, huge, and intimidating with wings spread wide. It was the dragon-creature from his childhood nightmare. The same one that continued to threaten to pluck him from the present, and then drop him into an alternate reality. All these years Mr. X had been able to thwart the beast, had been able to defend himself from it. This time, he’d had enough. He liked his construction-type dude / rock band guitarist life, thank you very much, and he was sick and tired of defending it! So with his bare hands, he lunged. . .. And if you think the twenty-seven staples look awful, suffice it to say the SHE dragon’s out of commission for good. *Sigh* La Muse was thoroughly entertained! So. What do you think happened to Mr. X? That’s hysterical! I loved all your guesses! No matter what embarrassing thing Mr. X actually did, it won’t hold a candle to your imagination! Mr. X was out walking his poodle, Miss Piddle, past the house of the neighbor he’s been lusting after for weeks. Just his luck she was outside, weeding her garden, in short shorts. Being a of the male variety, his eyes locked on her luscious backside and he didn’t pay attention to Miss Piddle, who wrapped the leash around his legs and tripped the poor sucker, uh, admiring male. He crashed to the ground and cracked his head on the low brick wall surrounding her yard. When he came to, he found himself patched up and being loaded into an ambulance, the beauty holding Miss Piddle’s leash, the EMT calling over his head, “Good thing he fell in front of your house, Dr. Sam.” Smitten guy would love to play doctor with THIS doctor. I love your post! I commented, but it’s apparent I should have proof-read 4 times instead of just two, because now when I read my comment, I see grammatical errors! Gasp! Hope writing it going great! LOL, Melia!!! I didn’t know you have a gift for humor. Perhaps you have found a new calling for your writing. I think you could do an anthology, called Mr X of course, with these 5 stories and sell a bundle. Just add a few thousand words to each story and you’re golden. Aww, thanks! Gotta admit, this one was fun to think about! LOL. Appreciate your stopping by, Eilis! Viola, I love it! Your muse definitely came through – LOLOL! Thanks so much for your addition to the list of possible ways Mr. X ended up with a stapled head! Now, now, Miss Viola — you know as well as I do that the muse must never be interrupted when she’s busy spewing out story! 🙂 It’s all good! Jessie, the only thing I can come up with is that he’s a dude! An anthology, huh? Now there’s a thought. . ..
Viola, that’s a good one too. Now I’m convinced Melia could headline an anthology with several authors and short stories about Mr. X. Go for it, Melia! LOLOL! Appreciate your vote of confidence, Maggie! *Blushes* Awww. . . thanks! So creative…love it…I’m sure reality is so much less interesting! Fun post! And great scenarios! Such a guy thing! Must be Very Embarrassing…but then, many things are Very Embarrassing to a dude that would barely bring a blush to a dudette’s face. Thanks for an entertaining read this morning, Melia. And, do consider the Anthology thing…it would be so fun to do, don’t you think? Melia, awesome post!! I love the way your muse works! I’m trying to wake my lazy muse up this morning!! Thanks, Paty, for stopping by! Hi, Judith! Thanks for stopping by! Diana! It’s been FOREVER since I’ve seen you! Thanks for stopping by, and for your kind words. 🙂 Have you tried bribing your muse? Chocolate sometimes works. Sometimes. Okay, okay. So most times I just threaten her. . .. Such fun stories, Viola’s included. 🙂 My muse would love to join in but she is chained to the desk so she can finish our own work. Thank you for the smile and the prod to our imaginations. Yes, you must keep your muse in line – no play until business has been completed. Now, if I can only convince mine to do the same!